Main chassis constructed from 1.3mm premium bovine leather. Extended high rear waist construction provides greater overlap with the riding jacket. Large stretch panels on calf area for improved fit and feel. Waist circumference adjustment allows riders to tailor the fit. Internal mesh lining with stretch panel inserts work in conjunction with outer stretch zones for freedom of movement. Dynamic Friction Shield (DFS) offers excellent impact and abrasion resistance. External dual density TPU knee sliders are removable and replaceable. Internally reinforced seat and CE-certified knee area for additional protection. Nucleon hip protector CE-certified Alpinestars GP-R protection on knee for impact protection. The pants are sold in European sizes, so please use the chart below to choose a size based upon your MEASURED waist. As with past models of race/sport pants from Alpinestars, we find the pants to run smaller than indicated by Alpinestars, so for each size, we’ve listed the US waist given by Alpinestars (both tagged in the pant and in their published chart) and also our estimate of actual waist size. We’ve also indicated an estimate for approximate inseam of each pant size. In a race pant like this, the pants are designed only to go down to your ankle bone (top of the foot), and so the inseam indicated will be shorter than the inseam you are used to buying in jeans (about 2” actually), so don’t be thrown off. You can either measure your inseam (from the crotch seam on snug jeans to the top of your foot would be a good indication), or to get a good idea, just subtract 2” from the inseam you normally buy in pants. Here’s the new version 2 Track V2 Leather pants. These pants offer very good comfort along with fantastic protection feature for both track and street. Like all the other track pants from Alpinestars, these are largely leather with panels of stretch material to make them flexible enough to move in them. One thing I can see immediately with this new version is the expanded use of the stretch materials. There are LARGE 4 way stretch panels in the crotch, inside the thighs and down the back of the leg. These panels are larger than on most other pants. And then there are VERY large rounded leather accordion panels above the knees and below the waist in back. Those fabric stretch panels have an added useful feature of allowing some venting air to come though. And if you look closely, there are some small perforated areas on the front upper part of the pant. A black leather race pant like this won’t be comfortable in really hot weather no matter what, but the fabric and those smaller perf areas will help some with air flow through the pant. I pulled out the knee armor in these pants and was pleasantly surprised. The knee armor piece is large, but very flexible and has a plushy backing on it to make it feel good against your leg and knee. It slides in an internal pocket with a very nice liner around it. Inside the pocket is a strip of Velcro you can use to adjust the height of the armor too. On the outside of the is a hard plastic external knee armor piece. Normally I’d be wary of knee armor inserts in a pant that didn’t have a pretty firm structure, but since this pant has the hard external armor piece, the more cushy internal armor piece should be fine. I’d take this setup over a harder internal insert type armor any day! Hip armor is included also. It installs through a zipper tucked up just below the waist band. It attaches to the inside surface of the leather shell with Velcro so it can be adjusted with regard to position in all directions. I like they way the hip armor is installed behind the inside liner rather than dangling from the waist band in separate pockets. It’s a slick setup. 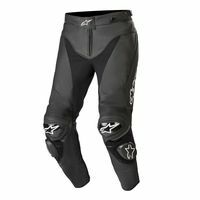 Alpinestars says: Alpinestars CE-certified Track v2 Leather Pant is a supremely comfortable and versatile performer for both track and street use. Packed with class-leading protection and stretch paneling to ensure an ergonomic, contoured fit this pant can be used in conjunction with a range of Alpinestars leather jackets.